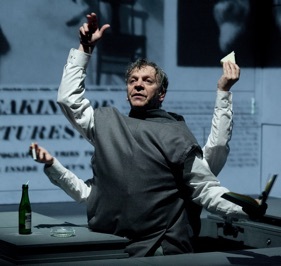 Robert Lepage’s new production of Needles and Opium is a brilliantly inventive, exquisitely beautiful work of theatre art. As in Lepage’s very best pieces the apparent simplicity and fluidity of presentation conceals the underlying complexity of stage technology needed to produce it. It is a work that can be enjoyed purely for the magic of its dreamlike concatenation of images. The images rappel off each other to tell three combined stories, but as in a work of visual art, more than in a work of drama, what is important is not the plot but the cumulative emotional impact that the images create. Needles and Opium (Les aiguilles et l’opium) was in 1991 Lepage’s second major solo production and made his name as one of the world’s theatrical visionaries. The new production that premiered in Quebec City in September this year is no longer a solo show and features new scenography and new images. The three stories all remain the same. The impetus for the work is the coincidence that in 1949 French poet Jean Cocteau (1889-1963) was travelling by from New York to Paris while American jazz trumpeter Miles Davis (1926-1991) was visiting Paris for the first time and astonishing the city with his art. Cocteau had travelled to New York high on opium still mourning the death of his lover Raymond Radiguet (1903-23). Davis, a sensation in Paris, falls in love with singer/actress Juliette Gréco (born 1927), but feels he cannot marry her and expose her to the prejudice with which Americans still viewed mixed marriages. In despair he travels back to New York and falls into heroin addiction. To these true stories, Lepage adds a third fictional one about a Québecois actor not coincidentally named Robert (Marc Labrèche), who in 1989 has travelled to Paris to record the voice-over for a documentary about Miles Davis (Wellesley Robertson III) and Juliette Gréco. Robert is still in love with the person who left him and has now moved to New York. Because he is having difficulty doing his job properly, he tries hypnosis therapy to get over his loss, even though this therapy involves exploring the loss more deeply in order to purge oneself of it. While in Paris, Robert stays in the same room in the Hôtel La Louisiane where Juliette Gréco used to stay, both because of its associations with the past and because its the only room with an en suite bath. This all three stories involve characters in grief over loss of love and engaged in altering their minds as a way to obliterate painful memories. The original production involved a large revolving screen for back-projections, Lepage hanging from a harness in front and use of a body double for quick changes. The new production is much more technically complex. The set consists of three adjacent planes of a cube tilted so that centre stage is the corner where the three planes meet. A hidden machine rotates the cube in a clockwise direction on an axis where a line from the vertex would be parallel to the stage. Because of the slow, near-constant rotation of the cube, the floor of Robert’s hotel room, for example, will gradually become the stage right wall, the stage right wall will, become the stage left wall, and the stage left wall will become the floor. Since doors and windows are hidden in all three walls, Lepage places us in a disorienting world that is continually changing. Projections on each of the three walls are synchronized with the movement so that Robert’s hotel room can easily morph into his recording studio or onto the concert hall where Davis is playing or into the space outside the hall where David first overhears Gréco singing or to the exteriors or interiors of tenements in New York. Labrèche and Robertson both frequently wear harnesses to fly in front of the cube or to enter the cube from door or windows that have rotated upwards. At times the image of a starry sky is projected on all three walls of the cube. This is when Cocteau (also Labrèche) on his flight back to Paris usually appears and quotes excerpts from his essay “Lettres aux Américains” written during that flight. Cocteau’s general theme is that Americans celebrate their love freedom but are in fact afraid of it since they fear opening themselves up to their dreams of the unconscious. 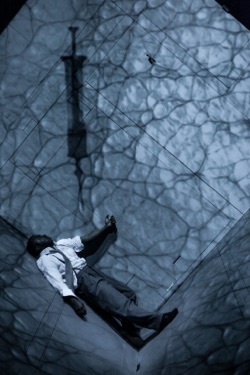 Lepage’s theatre piece, in contrast, celebrates plunges us into the dream state and the unconscious. The central irony of this, like all of Lepage’s other work, is that the achievement of the illusion of a free association of images requires extraordinary discipline, or lack of freedom, from his actors. Their every gesture and movement must be precisely timed to fit into the overall choreography of changing projections on the three walls and the simultaneous rotation of the cube. The show is filled with one amazing visual sequence after another. A hypnosis spiral appears in a niche in a doctor’s office, grows as a projection to cover the entire wall eventually swallowing up Robert entirely. Miles Davis readies his arm for a heroin injection and a huge projection of a needle presses down onto his arm. Lepage recreates Cocteau’s famous photo shoot for Life magazine where the poet was portrayed as a multi-armed deity holding a book in one hand, a sandwich in a second, a cigarette in a third and gesturing with a fourth. Davis’s story move forward in the time to 1958 when he has overcome his addiction and returned to Paris to record, entirely through improvisation, the soundtrack to Louis Malle’s film Elevator to the Gallows (L’ascenseur pour l’échafaud) while Robert interview’s Malle about Davis’s astonishing accomplishment. Davis thus becomes an image of accommodating grief not by avoiding it but by giving in wholly to it in order to come out (literally in Lepage’s staging) on the other side. Lepage’s new Needles and Opium is quite simply the must-see theatrical event of the year. Photo: (from top) Marc Labrèche as Robert. ©1994 Bengt Wanselius. Wellesley Robertson III as Miles Davis; Marc Labrèche as Jean Cocteau. ©2013 Nicola-Frank Vachon. For tickets, visit www.canadianstage.com or http://nac-cna.ca.